Hello all! After Survivor Polls have taken the forum by storm, I thought I would switch things up and do something new. 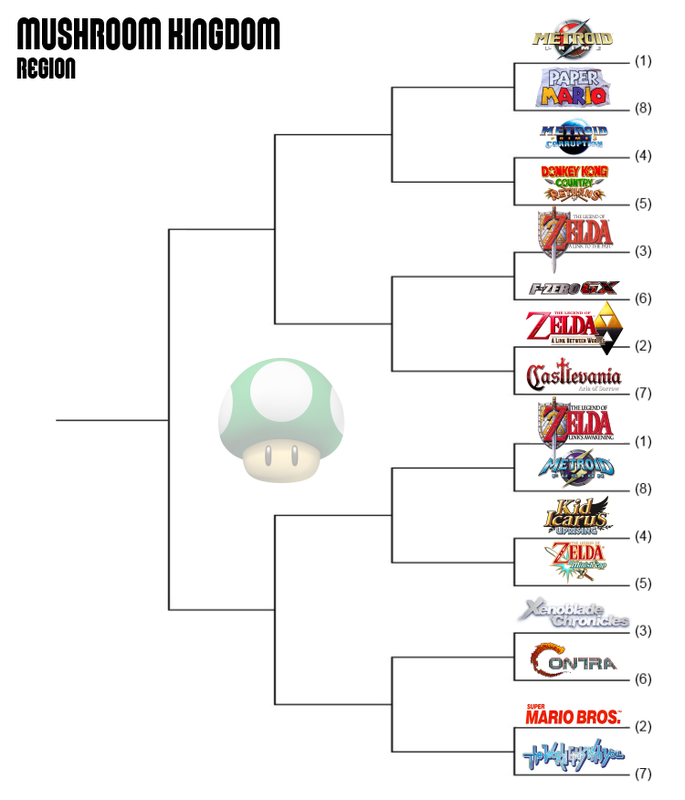 Since it's March, why not use a little format everyone knows and see if we can't find a new way to crown a champion of Nintendo games! Yes, it will be Ocarina of Time, but at least there might be some suspense! 4. Wario Ware: Mega Microgame$! 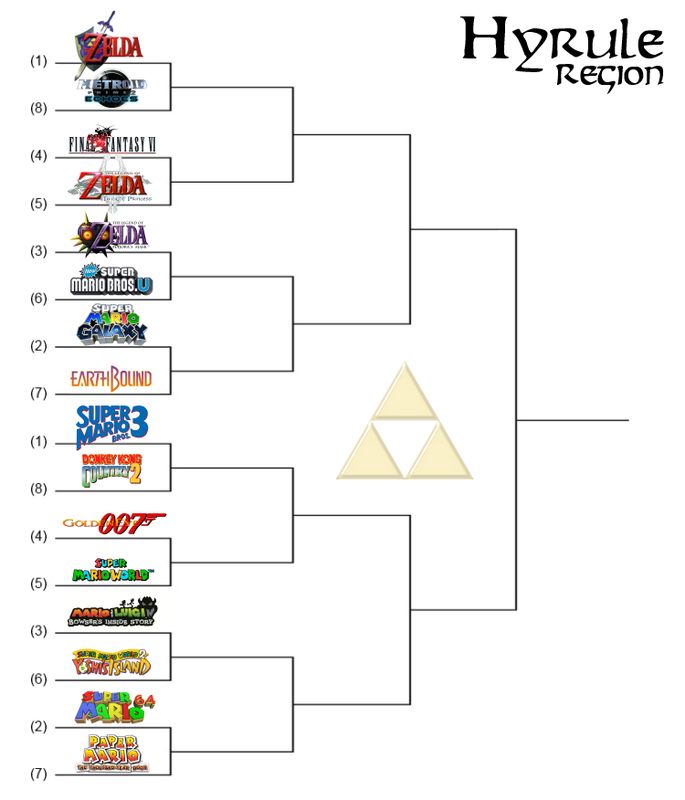 With seeding done, I created four regions and randomly assigned two games from each seed to the regions, so that a random one seed was playing a random eight seed, a random two seed was playing a random seven seed, etc. 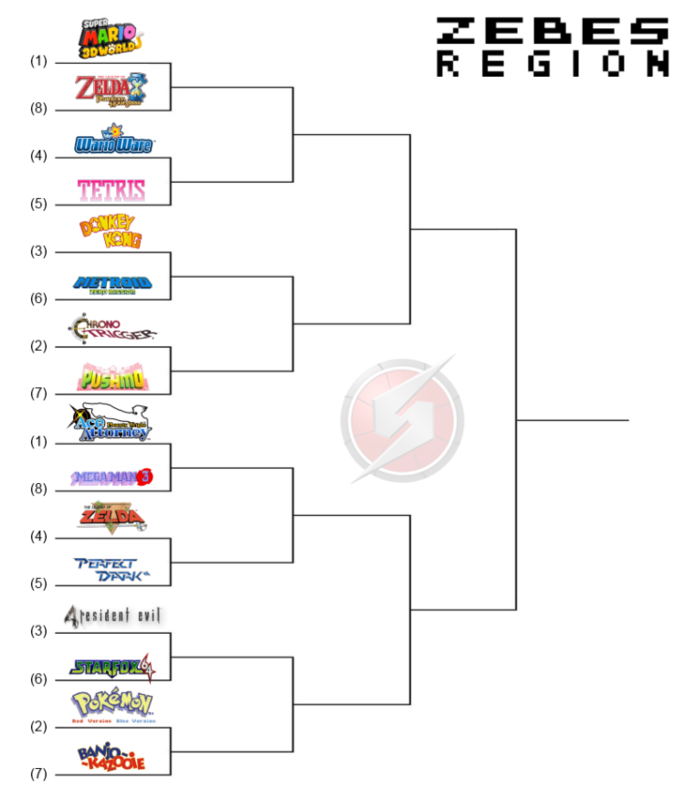 I used some discretion to rerandomize if I felt that a system or franchise was overly represented in a region, but there is no rhyme or reason to how they are arranged otherwise. Starting next week we will begin voting region by region for games to advance until we arrive at victory. For now, let's just discuss the seeding, see who got screwed by random chance, what we think might be good upset possibilities, etc. If you don't like anything about how I set it up... too bad! Special thanks to The Big G for these awesome graphics! No it's not inaccurate since nothing here says that these are official North American titles, does it? I reserve the right to refer to games however I feel will be most clear. Don't like it? See the above rule. Who's acting like a 12 year old again? If you see FFVI listed above do you really not know what game it is? Is it worth complaining about and campaigning to get it changed? Or are such antics nothing more than annoying pedantry? I don't really have a horse in this race at all (talking about this conversation), but teeeeeeccccchnically "Final Fantasy 6(SNES)" isn't a game that exists. And yep I'm kind of just being a nudge here. Stache is a stickler for this kind of stuff, so no I don't see it as just annoying pedantry. If I'm compiling a database for games that were published on the Super Nintendo, I'd say Final Fantasy 3 as well. If I'm just talking about the game in general, I say FF6. I do it all the time. It refers to a game that exists which is the only function of the words that I have chosen to use in my tournament. Since not a single person has failed to understand the game to which I am referring, it has performed its function to perfection. 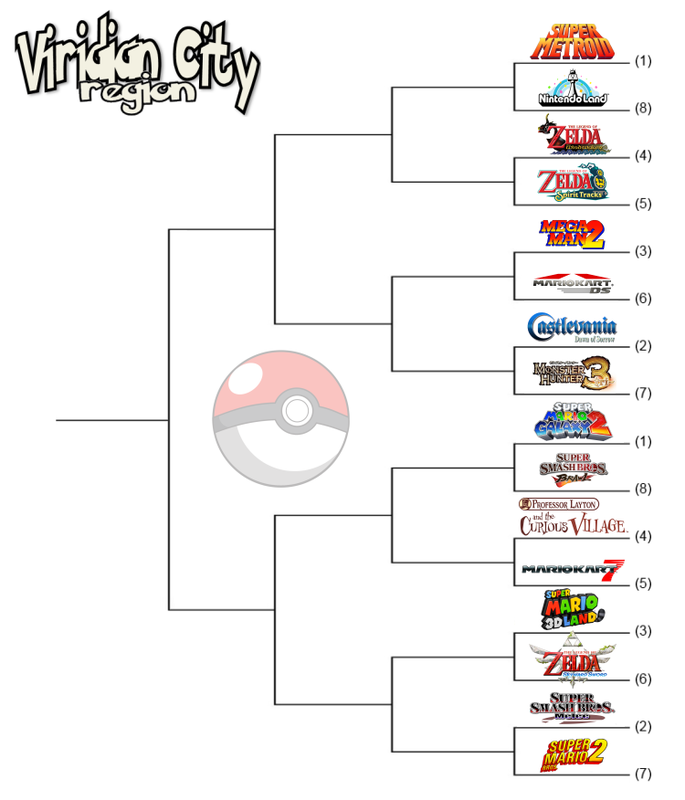 I DEMAND the 7th seed in the Viridian City region to be renamed Doki Doki Panic. @PogueSquadron Luigi's Mansion 2 is the game's title in Europe, Japan, Australia.... everywhere but North America, in fact. So it is, indeed, a "real game." The Final Fantasy III (DS) game isn't on the SNES. By tagging it "Final Fantasy III (SNES)," all of the necessary information to convey the appropriate understanding / response is there. Super Mario USA is entirely more accurate, honestly. Doki Doki Panic was the source game before they covered 'em up with Mario characters. Its even far more confusing because what we know as Lost Levels is Super Mario Bros. 2 over there. If you don't like anything about how I set it up... too bad! 'Being a stickler' is just a nicer way of saying 'annoying pedant' IMO. And if he wants to go make a database or a list of his collection, then that's fine, he can go write FFIII a thousand times to his heart's content. I'm not going to argue with him. But coming in here whining about how Jargon has it 'wrong' and that it should be changed?Thats just ridiculous. He can be a stickler/pedant all he likes. That doesn't mean everyone else has to comply. Does not Final Fantasy VI convey all the required information? Did you really not know what game he was talking about? I'll have to apologize for being annoying for the sake of being annoying. This whole thing was just driving me crazy. I just didn't think Stache really did anything wrong here and I didn't think he really deserved to be jumped on or anything. He didn't even sound that mad or anything. It's just a poll after all. Hopefully we can all let this go and get going on with the voting. (And usually, I do call it FF6, for the record. I just don't think there's anything wrong with labeling it FF3. Both have their merits on a poll like this). Awesome game no matter what we call it. edit: I didn't really see his posts as whining. He said poop sandwich for crying out loud, he couldn't have been that mad about it. If this was an isolated incident I might have agreed with you, but this is far from the first time where he's given people grief for not abiding by his personal standards. I'm tired of it, and am going to point out the silliness everytime it happens. I'm just saying, if someone were to say FF6, I would assume they were NOT referring to the SNES version. It's like telling someone you played the PAL version of Starfox 64. Most people would get what you were saying, but it's technically incorrect and looks odd. And I wouldn't say Stache is a pedant, I don't think his intention is to show off. He's just an eccentric guy and I feel bad seeing bad blood brew between members of our community. Shoot, after all this, FF3 better take home the friggin' gold! Can I go on record as saying that either way someone says Final Fantasy III / VI works for me? As long as I know what they're talking about. I think the difference there is that his poll was about the SNES, so it made sense. Since this feature isn't about any specific system, it probably makes more sense to use FFVI. Or maybe Final Fantasy III '94. Joking! Or we could call Final Fantasy VI Advance Final Fantasy III '07 instead. Or Final Fantasy III DS Final Fantasy III (the not as good as the other Final Fantasy III edition). I actually didn't know that the VC still refers to it as Final Fantasy III until last night. I thought they changed it. Huh.. I thought the game title was Donkey Kong '94.. It's not?? It's just "Donkey Kong," which is kind of confusing. Similar to how Wario Land on the VB is just called "Wario Land" (and on a related note, Mario Tennis for the VB and N64 both share the same name).